Branding yourself or a business for the first time can be scary. After all, your brand is your business image and identifying feature. It’s something you should put a lot of thought into, isn’t it? Yes. Sometimes business plans are stalled due to branding concerns, that’s how important branding can be for a business. When it comes to your own brand, you need to be just as diligent. You assert that diligence by asking important questions. Your questions should be focused on one thing: brand completion. These questions should lead you to finalize your branding decisions, further cementing your brand as a true winner. These three questions in particular can help you develop a truly killer branding scheme. I’ve talked about it before, but your brand has a personality. In fact, it is the representation of your business’ personality. What else has personalities? People! If you’re trying to pin down who your business really is, actually look at it from the angle of it being a real, living person. What does your brand look like? What do they sound like? Are they in their 40s with three kids? Are they black or white, or maybe another race altogether? Are they a male with entrepreneurial goals? Establishing a face helps you put into perspective the voice that goes along with that face. If when you finally pin down who this person is, you can further shape your business’ brand identity. If you’ve ever seen an article about a huge branding mistake and wondered “how did they let that happen?,” it’s usually because those who create branding schemes have tunnel vision without outside perspective. When the only opinion in the room is your own, it’s easy to think you’re 100% right. Getting outside data is always important when it comes to branding. This helps you identify the public response to your branding. It’s not always as salacious as a branding strategy being offensive or downright horrible — sometimes it’s the little things that can really make a difference. Analytic data can help you fine-tune your brand from the inside out. Make no mistake — you can change your branding down the line. In fact, many businesses do exactly that in order to revitalize their image. However, just as many brands remain the same, or only implement small tweaks, during the longevity of their business. You may not stick with your brand as is, but the branding strategy and scheme you choose should be one that you could feasibly use for as long as you’re in business. The biggest takeaway is that your brand scheme can’t be slapped together — once it’s final, you have to live with it. Think of branding questions as exercises in creativity and business knowledge. Asking and answering questions like these helps you stay in touch with the heart and purpose of your business. The more thought you put into your branding, the less likely it is that your business will be a flash in the pan. NEW! 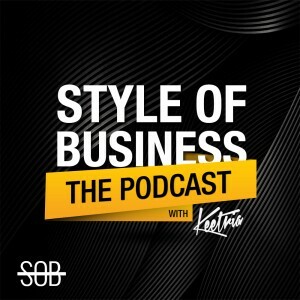 SOB Episode: "Find Your Own Place In Your Own Space"